CRM in accident prevention. Source: F. J. Mendi (2012). Home//CRM in accident prevention. Source: F. J. Mendi (2012). CRM Training is a powerful tool, powerful enough to break the links in the chain of events for individual accidents; managing the error correctly, detecting it in advance, diminishing its incidence and mitigating its consequences. All the foregoing before the accident happens. CRM was born in 1979, at he ‘Resource Management in the Flight Deck’ conference promoted by NASA. The longitudinal studies carried out by prestigious institutions showed not only Human Factors implication in flight incidents and accidents but also the lack of coordination carried out by the crews. They concluded that most of aviation accidents have plenty of characteristics in common, and they were not related to pilot’s technical abilities, but to teamwork. CRM arose then with the intention to establish effective barriers against error. If we want to develop strategies to reduce Human Error we will have to watch beyond, trying to look for the true Contributing Factors that have pushed the crews to commit them, to fail in their detection or to allow unacceptable safety consequences. We need to be brave enough to get to know the real state of our organizations and companies at all levels, more even when the vulnerability of our Safety Management Systems is increasing by the influence of multitude of factors as the increase of the aerial traffic, the multiculturalism, the diversity of fleets, routes, services and fundamentally our real incapacity to define effective prevention strategies. In the beginning the addition of CTM concept (Cockpit Task Management) to CRM Training was considered as a vital step. Resource Management implied prioritization of all resources available in the cockpit, emphasising first on the control of the aircraft, followed by navigation, internal and external communications, and finally the proper systems and flight equipment management. Later Jensen defined the CRM in terms related to the Decision Making Process: “Application of the good judgment in aviation within a crew”; including the social dimension and emphasizing interpersonal communication and relationships. Helmreich and Foushee developed a model based on group and personal abilities including concepts related not only to the man-machine interface and Situational Awareness (SA), including also other activities and interpersonal skills as leadership, teambuilding, problem resolution, and decision making processes. TEM (Threat Error Management) is one of the lasts evolutions of this type of Training; in fact it is known like the Fifth Generation of CRM. The studies made by Professor James Reason on Error supposed the return to the origins of the CRM, having taken up again a concept sometimes forgotten: Human Being infallibility and his predisposition to error. TEM is linked to the origin of LOSA (Line Operations Safety Audits) and the increasing interest of some companies in knowing the degree in which the instruction received by their crews had a reflection in their behaviour aboard. LOSA is the result of a deep and thorough cooperation between the Human Factors Research Project carried out by the University of Texas and Delta Airlines. These audits were based on flight cabin watching, and could be summarised as follows: “We simply intended to analyze airline’s health; to measure its cholesterol”. The result of LOSA audits to more than ten thousand pilots from different companies became the base where Robert Helmreich team defined TEM principles. Under the premise of Human Error existence, managers and safety professionals had to focus on error’s effect mitigation. Although all data collected was confidential, some have transcended with the idea of reflecting TEM effectiveness. It seems incredible that they found errors in 64% of LOSA audits during air operations; but what it is more incredible is that after TEM implementation a reduction of at least a 70% in errors observed during the next audits was observed. In times of crises we don’t assume the responsibility of investing in safety. However we can state the following: “If you think safety is expensive, wait for an accident”. Tough, but very true. There are two main reasons to trust CRM as the only capable tool to reduce actual accident rates. First because according to the sources consulted, in almost 85% we find that the main Casual Factor of accidents is related to Human Error. Secondly because the pilot in command is still the only “aircraft system” that is not duplicate; in fact it mandatory to count on something able to avoid Human Error consequences offering defences in order to avoid error transformation into catastrophe. Professor James Reason Human Error model is the most widespread in aviation. 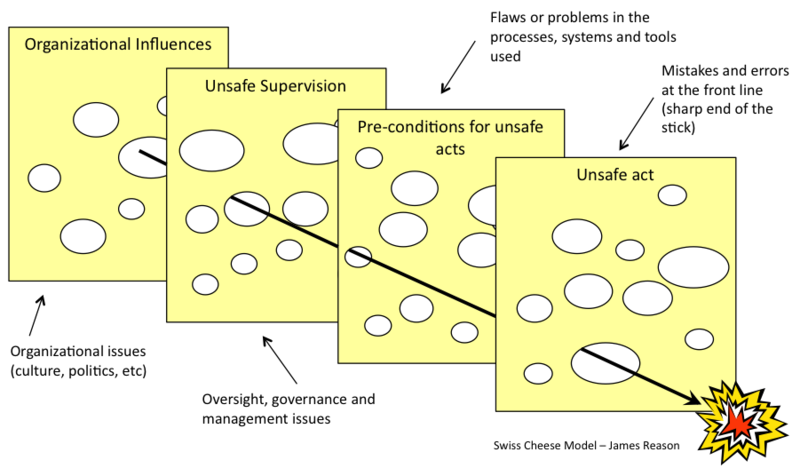 Also known as the Swiss Cheese model it describes four levels of Error, each one as a result of former. In every accident the first level contains the Active Failures, the crew errors. It is in this level where we have focused investigators attention on for a long time. However, it is related to crew coordination where the greater number of Causal Factors has been discovered. But it is certain that they are not the unique ones, not even the most significant. One of the model strengths is that it allows the investigators to connect Causal Factors deduced from the first level with the remaining three, without loosing site of Causal Chain or Errors Chain analysis. This way, we could bear in mind all Latent Failures present in accidents as Contributing Factors in each decision level. Its weakness is the impossibility to define these Latent Failures in advance. In other words, Reason Model never defines what the cheese holes are, at least in daily operation context. If our intention is to reduce accidents rates for the very next future, investigators must set the holes up of all barriers not only during accident investigations but before they happen in order to mitigate error consequences. Second Reason Model’s level is related to conditions as fatigue, lack of communication or poor crew coordination. They are the abilities empowered by CRM. Whenever we are not able to determine the holes of this barrier we will include deficiencies in our Training Programs acknowledging CRM opponents to be right. We can’t be satisfied just fulfilling regulations. On the contrary we should develop effective strategies against error if we don’t want be doomed to errors from the past. HFACS (Human Factors Analysis and Classification System) is moulding itself as the ultimate turning point in safety tendencies. For the first time, investigators have a tool able to analyze and classify the accidents from Human Factor point of view. Based on Reason Model it can perform a complete taxonomy of the error in every aeronautical system level. The most powerful tool given to investigators up to now is the possibility of creating new Human Factors Data Driven CRM Training Programs. Without any doubt we have to be transgressors. We must bet on initiatives supported by new tools in hands of true experts. It is mandatory to promote investigation like the only way to excellence in aviation. The development of new effective strategies in the benefit of Flight Safety implies assuming Human Factors as the main contributing factor in almost every accident we have, so that we may build up a strong Safety Culture. Based on the Article titled CRM, The death of a myth or resurgence of phoenix, published by Francisco Javier Mendi in the Italian Journal of Aerospace Medicine, No 7 (2012). BAE SYSTEMS, BOEING COMPANY Human Factors-Harmonization Working Group, Final Report, Considerations in the Flight Deck Certification Process, FAA, EASA, June 2004.
Cooper GE, White MD and Lauber JK. Resource Management on the Flightdeck. Proceedings of a NASA / Industry Workshop (NASA CP-2120). Moffett Field, CA: NASA-Ames Research Center, 1980. Barba Román G. El Giro hacia la Eficacia del CRM (Gestión Integrada de Recursos Operacionales), Artículo del Colegio Oficial de Pilotos de la Aviación Comercial de España, 2004; 1. Detwiler C, Hackworth C, Holcomb K, Boquet A, Pfleiderer E, Wiegmann D, Shappell S. Beneath the tip of the iceberg: A human factors analysis of general aviation accidents in Alaska versus the rest of the United States (Report Number DOT/ FAA/AM-06/7). Washington DC: Office of Aerospace Medicine, 2006. ECAST (European Commercial Aviation Safety Team); EHEST (European Helicopter Safety Team); EGAST (European General Aviation Safety Team). Edwards E. Man and machine: Systems for safety, In Proc. of British Airline Pilots Associations Technical Symposium, 1972, 21-36. The most common way to perform operative evaluations consists of the combination between LOSA ́s and confidential inquiries results like Flight Management Attitudes Questionnaires (FMAQ). ESSI-EHEST Conference, Cascais, Portugal, October 13th 2008. Helmreich RL. On Error Management: Lessons from aviation, BMJ, 2000. Helmreich, RL. Error Management as Organizational Strategy. In: proceedings of the IATA Human Factors Seminar, Bangkok. Thailand, April 20-22th,1998. Helmreich R and Foushee HC. Why Crew Resource Management? In Empirical and Theoretical Bases of Human Factors Training in Aviation, Wienner E, Kanki N, Helmreich R. eds, San Diego CA 3-45. Human Factors Group of the Royal Aeronautical Society. Quality Crew Resource Management, May 1996; 7. IHST Website, Background, http://www.ihst.org/Default.aspx?tabid=1780&language=en-US, May 2010. Jensen R. Pilot Judgment and Crew Resource Management, Burlington, Ashgate, 1995, 97.
http://www.fomento.es/MFOM/LANG_CASTELLANO/DIRECCIONES_GENERALES/AVIACION_CIVIL/SEGURIDAD_AEREA /FUTURO /SISTEMAS/sgs_cultura.htm Spanish Civil Aviation General Dirction (DGAC) – Ministerio de Fomento, Safety Recommendations. Leymann Patt HO. CRM, Una Filosofía Operacional, Sociedad Iberoamericana de Psicología Aeronáutica, 1997; 35. Nullmeyer D and Montijo GA Human Factors in Air Force Flight Mishaps: Implications for Change. Interservice / Industry Training, Simulation and Education Conference (I/ITSEC), 2005. Reason J. Human Error, Cambridge England: Cambridge University Press, New York, 1990. Reason J. Managing the Risks of Organizational Accidents, Aldershot Ashgate, UK, 2003. Salas E, Wilson KA and Burke S. Does Crew Resource Management Training Work? Human Factors and Ergonomics Society, 2006 Vol 48. Shapell SA. The Human Factor Analysis and Classification System HFACS. FAA Civil Aeromedical Institute, 2000; 2. Von Thaden TL and Steelman KS Classifying Crew Performance Failures in Commercial Accidents: Can we Get the Numbers Right? Human Factors Division University of Illinois at Urbana-Champaign, IL , 2005, 1-3. Wiegmann DA and Shapell SA. Human error analysis of commercial aviation accidents: Application of the Human Factors Analysis and Classification System (HFACS), Av Space and Environ Med,2001; 72:1006-1016. Wiegmann DA and Shapell SA. A Human Approach to Aviation Accident Analysis, the HFACS System, Aldershot Ashgate, UK, 2003. Wilhem JA, Helmereich R, Kinect JR, Merrit AC Culture, Error, and Crew Resource Management. In Salas E, Bowers CA, EDENS E Eds. Hillsdale, New Jersey, 2001.